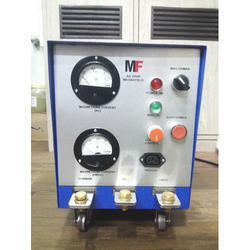 Electroflux Magnetic Crack Detector equipment is designed for non-destructive testing of ferrous iron and steel parts. Electroflux equipment will locate cracks and other defects in parts which can be magnetized. When properly used, Electorflux will locate such defects as fatigue cracks, heat cracks, grinding checks, forgings laps, shrinks and tears in castings, improper welds and inherent defects in metal such as seams and inclusions as well as cracks due to overstressing of parts. These defects may not be visible to the naked eye but can be located rapidly and accurately with this equipment. Instruction Manual of Toshniwal Instruments & Engg. Co., New Delhi. 4.1.1 - When the dry method is used, select a powder with a colour that will provide good contrast to the surface to be inspected. 4.1.2 Surface Preparation: When using the dry method, be sure that the surface to be inspected will not prevent the particles from forming indications of defects. To ensure this, the surface must be free of any sticky or gummy substance which would cause the powder to stick and not move freely over the surface. In general parts must be thoroughly cleaned of any oil or grease and must be dry. Rust or a good coat of paint on a part will not interfere with using the dry method. 4.1.3 Applying Powder: Powder may be applied to the part by a number of methods. A powder bulb or hand operated squeeze type applicator may be used, or a mechanically powder blower may be used. Some times powder may be simply thrown onto large surfaces. The suitable method of applying the powder depends partly on the type of defects to be located. 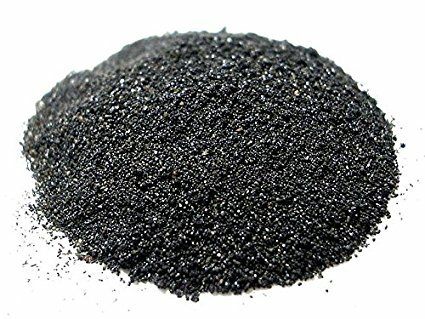 If very small defects are anticipated, quite a bit of care must be used in applying the powder and too thick a layer of powder must not be applied for danger of hiding defects. When fairly large or deep defects are anticipated, less care is necessary in applying the powder, as a strong leakage field will exist at the defect. The general method for applying powder is to cover the surface of the part with a fine film of powder. Since the leakage field at defects will not attract the powder at much distance, care must be taken to ensure that the powder moves over all the surface of the part. Best results are usually obtained when the continuous method is used in conjunction with the dry method. This combination is called the dry-continuous method. When using the dry-continuous method, the current remains on all the time the powder is applied. Observation of any defects must be made while the powder is applied. Usually excess powder must be carefully blown from the surface of the part to avoid obscuring any defects. For small parts, the operator himself may blow the powder away or a low pressure blast of air may be used. If too much force is used in blowing the excess powder away, any indications which are forced will also be blown away. A trained operator will be able to tell the difference between an indication formed by a defect and a false indication caused by a sharp change of section or irregularity on the surface of the part by the way in which the powder is attracted during magnetization and application of the powder. Also a trained operator can judge the depth of a crack by the manner in which the powder builds up at the defect. Surface cracks will cause a sharp line of powder, whereas subsurface defects will cause a broad band of powder. Cracks which are both open to the surface and quite deep will cause a broad and high build up of powder at the defect. The dry-residual method (combination of dry method and residual method) can only be used when the surface to be inspected is quite smooth, so that the particles will freely move over the surface. The dry-residual method should be used with great caution since there are few applications where it has proven satisfactory. If necessary, clean powder from surface after inspection. Particles might damage bearings, etc. If not cleaned away. Connect the magnetising cables to A.C or Half Wave Direct Current as required. The remote control adopted should be connected to ‘g’ socket. Hold the job between magnetizing cable and press bigger switch (remote switch) to pass current. Indicator ‘f’ will glow indicating that the current is flowing through the job. The current passing through the job, will be indicated by the meter ‘a’. Infinite current control ‘e’ can be adjusted according to the requirement. Sprinkle Iron powder or pour wet Iron fluid as the case may be on the job.